As the Pac-12 South race develops, could the Pac-12′s replay controversy end up hurting the Utes? The scrutinized USC-Washington State game may play a significant role in the division. Utah coach Kyle Whittingham came away from a conversation with commissioner Larry Scott feeling reassured about the Pac-12's officiating method of reviewing plays during football games. If they beat USC this weekend, though, the Utes may have more regrets about what happened in a game that didn't involve them. A potential targeting penalty that was not called against USC in a 39-36 win over Washington State could factor significantly into the Pac-12 South race. Here’s how: If the Utes win Saturday, they would be tied with USC at 3-2 in conference play and own the tiebreaker with the Trojans. Utah’s remaining schedule is more difficult, with No. 12 Oregon visiting Rice-Eccles Stadium in November and USC missing the Ducks this year in the Pac-12′s scheduling rotation. That’s why a Washington State defeat of USC on Sept. 21 would have helped Utah. The game included the play that led to scrutiny of the Pac-12′s replay system, following the Yahoo Sports report that a high-ranking conference administrator was involved in the process. And another play late in the game may have been influenced by the first decision, creating a bigger mess that could affect Utah. During a visit to Utah’s campus for last Friday’s game vs. Arizona, Scott talked with Whittingham about how the conference has addressed the issue, taking administrator Woodie Dixon out of in-game reviews. In a meeting with the media, Scott said replay supervisor Bill Richardson has the final say on any play that’s reviewed, from the conference’s command center in San Francisco. Unrelated to the recent controversy, Whittingham has been frustrated for some time about the Pac-12's administering of targeting rules. The Utes were hurt by questionable calls against safety Marquise Blair and tackle Leki Fotu in a 21-7 loss to Washington, with Fotu's ineligibility for the first half in the next game at Washington State also affecting them in a 28-24 defeat. The Utes did benefit from a targeting call against WSU, keeping possession on a play when receiver Britain Covey lost a fumble. In any case, what happened in the USC-Washington State contest could have more to say about the Utes' Pac-12 South hopes than anything has happened in their own games. Concluding the third quarter, WSU linebacker Logan Tago was penalized for a personal foul — but without targeting being included — on a drive that ended in a USC touchdown. Dixon, the Pac-12′s general counsel and senior vice president of business affairs, had phoned in his opinion of that play to the conference’s command center in San Francisco, saying targeting should not be applied (Dixon regularly was involved in reviews under the Pac-12′s former system). 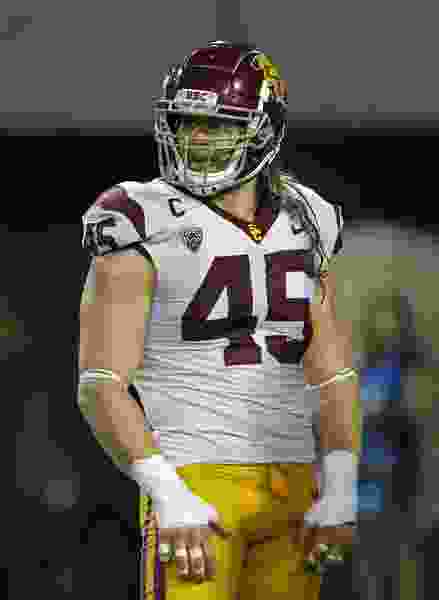 So there's a plausible, widespread theory that the replay crew, both at the league headquarters and in the press box in Los Angeles, may have used that in-game precedent as reason to ignore a possible targeting call against USC linebacker Porter Gustin on the Cougars' final drive. Gustin's apparent helmet-to-helmet hit on WSU quarterback Gardner Minshew was not flagged on a first-down play from the USC 25-yard line, and the replay crew didn't rule that targeting occurred, as it could have done. A penalty would have moved the Cougars to the USC 12. WSU ended up running the ball twice, reaching the 21, before Bingham High School graduate Jay Tufele blocked the Cougars' tying field goal attempt. Tufele may have made that play, regardless of the spot of the kick. Even if WSU had tied the game, USC could have won in overtime. Yet it’s possible that with a first down at the 12, the Cougars may have scored a winning touchdown. Most of this discussion becomes moot, from a Utah perspective, if the Utes lose to USC. Even if WSU had beaten USC, the Trojans in that case would be 3-2 after Saturday's game, with a one-game lead and the tiebreaker over Utah. Only if they beat USC will the Utes begin wondering how the Pac-12′s problem may end up hurting them. And even then, they could claim the South title by winning their remaining five games. The Utah men’s and women’s basketball teams will stage a combined Night with the Utes on Wednesday (7 p.m.) at the Huntsman Center. Admission is free.